/ Do Coins Reveal the Futility of our Times? Do Coins Reveal the Futility of our Times? The study of coins, numismatics, has constantly expanded our knowledge of antiquity in recent decades through new discoveries which have proven so many old theories wrong and turned academics on their head when it comes to their theories. Without the consideration of the coins, many questions of ancient history would never be answered. Nevertheless, many ancient historians still have a great reluctance to deal with this special discipline and to use their often valuable results. Conversely, many numismatists fail to comprehend the vast importance money has played in the history of humankind. It becomes increasingly rare to find the two fields merged to answer important questions from a larger historical context. I have written before how the academics declared Historiae Augusta fake because it listed people they never heard of such as Gaius Julius Saturninus. Then, two gold coins were discovered in Egypt with his name and suddenly that book was proven to be history. To this day, you will find still notes saying Historiae Augusta is questionable. Academics just hate to admit a mistake even when you prove it to any rational human being. I have stated many times that we were all taught in school about the Decline & Fall of the Roman Empire. The seminal work by that name was of course written by the English historian Edward Gibbon. However, his work was the assembly of contemporary accounts with no real input from coins. His conclusions were primarily fundamental explanations based upon his opinion. Because of that, his work was highly criticized because of its view on religion since we have the rise of both Christianity and Islam covered in his work. According to Gibbon, the Roman Empire succumbed to barbarian invasions in large part due to the gradual loss of civic virtue among its citizens of which included the role of Christianity. This certainly provoked an ongoing controversy about the role of Christianity historically. He did, however, also attribute weight to other causes of the internal decline of corruption in addition to external invasions from various barbarians in the north and Persians in the East. Some have argued that the fall of the Roman Empire should not be a surprise but the question should be how did it last for so long. The military legions enabled the fall of the Republic and then they violated the authority of Emperors. The Emperors, looking to secure their power, in turn, overpaid troops to try to maintain loyalty which like love cannot be bought. This, in succession, reduced the dignity of the military corrupting the discipline which created internal enemies following a general in search of power, money, and the throne of glory. This, Gibbons asserts, enabled the Roman world to be overwhelmed by a deluge of Barbarians. 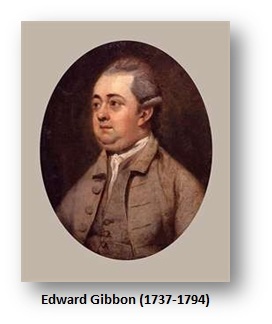 We must keep in mind that Gibbon was influenced by the events of the 18th century as the British had entered a period of intense anti-Catholicism. What was clearly missing from Edward Gibbon’s work was any bridge between ancient history and ancient numismatics. My work has been directed at eliminating human opinion. Where Gibbon was colored by the intense anti-Catholicism in Britain as a remanent from the Civil War and beheading of the Catholic King Charles I, my efforts are colored by simple economics. The background to the origins of the coinage is essential to comprehend the dynamics in the rise and fall of ALL great empires. The political dimension of the coinage is rarely taken into account. This failure has still left much of history in the dark. 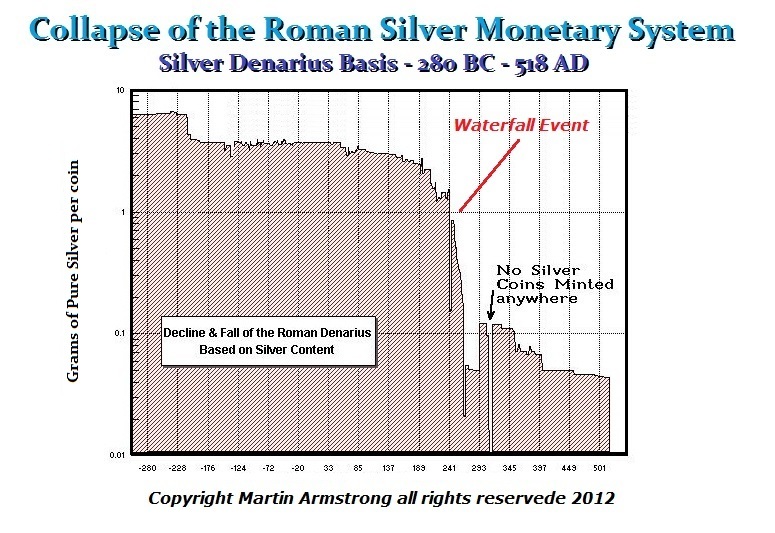 I recreated the monetary history of Rome from the coinage for the simple reason to answer a question: How did Rome Fall? Was it gradual or a crash & burn? The coinage allows us to sort out the fact from the opinion. Gibbon clearly had a bias against religion for he saw how that tore Britain apart. He colored the fall of Rome with that bias. What Gibbon failed to understand was the economics came first and the capture of Valerian in 260AD sent a panic through the Empire. People turned to Christianity AFTER Rome was falling and prayers to their gods failed. The Christian persecutions took place at that time during the 3rd century AD because many took the positions the Empire was failing because the gods were angry at the Christians. 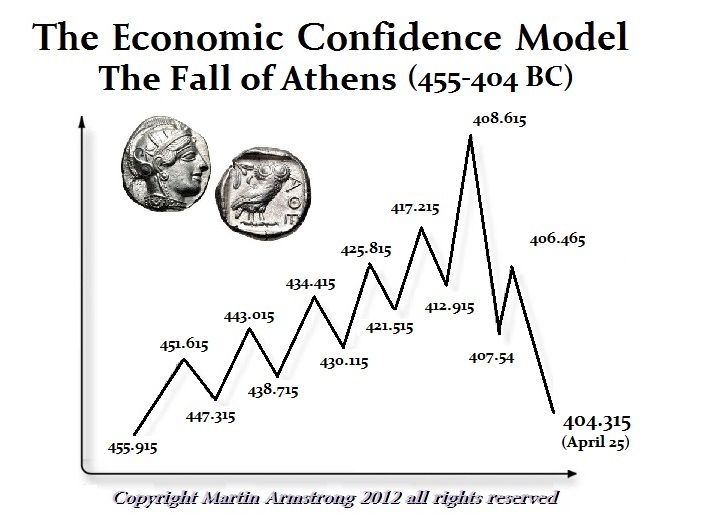 The coinage reflects the economic crisis providing us with a timeline rather than just opinion. The religious conflicts between Puritans and Catholics in Britain during the 17th and 18th centuries was rooted in a completely different mechanism. Even when John F. Kennedy was elected president in the USA, there were many who still took the anti-Catholicism position asserting that the Pope would then be running the United States. This was a divisionary attitude in Christianity (Protestant v Catholic) which was significantly different from the religious conflict in Rome during the 3rd century (Paganism v Christianity), not a question of a Pope usurping power over government. 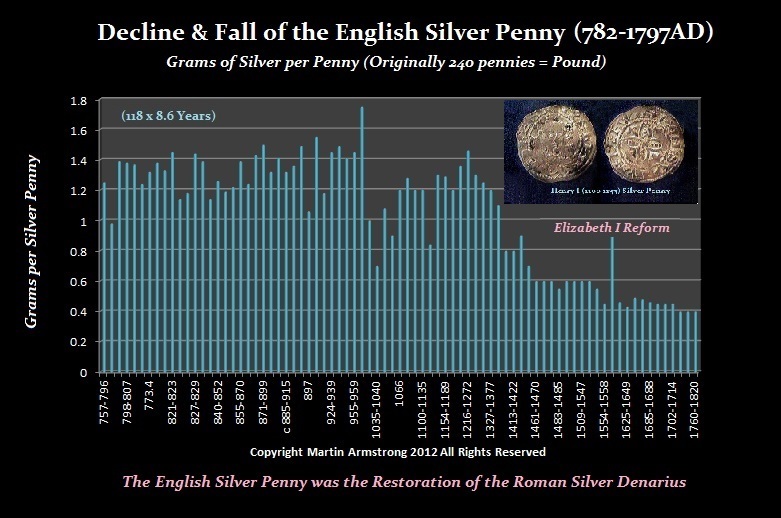 Reconstructing history from coins provides a timeline that is definitive and not subject to speculation or opinion. In this manner, we can actually determine not just cycles, but why history repeats when given the same economic conditions, humans will ALWAYS respond in the same manner. We have used the coinage to reconstruct the entire monetary history of the world. 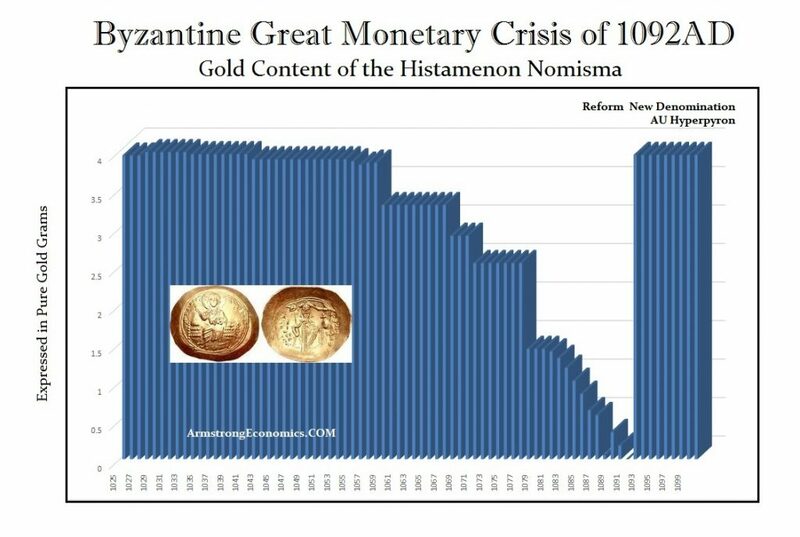 When we accomplished this research effort, then and there we could suddenly see not merely how the rise and fall of empires, nations, and city-states was reflected in the monetary system, but the consistency across all political systems. The cost of the Peloponnesian War and the loss of Athens to Sparta was clearly visible in its coinage. Two years before the surrender of Athens, its coinage was debased to bronze silver plated. The coinage stands as a witness to the same patterns of inflation created by war. 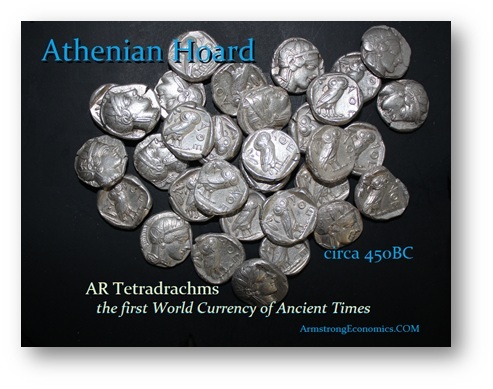 The Hoard of Athenian silver Tetradrachms we have used for study is from the period just prior to or at the beginning of the Peloponnesian War (431–404 BC). They are still of the finest silver and the condition of the coins is really exceptional. They have very little evidence of circulation confirming that they were stashed at the beginning of the war and were hoarded. Many still have underlying luster from recently being struck. Obviously, the person who buried then coins did not survive to reclaim them. The cost of war has historically had always been inflationary. In Lydia, where coins were first invested, we can see the reduced weight as the cost of war increased against Cyrus the Great of Persia. In ancient times, the profits to the victor were often great. But the loss to the vanquished often led to their citizens being sold into slavery. Today, governments wage war more often for the private benefit of select groups rather than the state. The invasion of Iraq made billionaires out of Cheney’s friends and left the American people with endless trillions in debt that will last collecting interest to constantly roll indefinitely until the crash and burn. Perhaps nobody wants to look at the evidence coins provide us because they do not like the conclusion. The one thing this research has provided is a glimpse of the futility of our situation and how governments will never learn anything from history.